28S-DMH-119 is a ‘28S’ 4Ground model kit, ‘28S’ means this kit is highly detailed inside and outside with many pre-painted parts. This kit includes pre-painted parts with high levels of internal and external detailing. Most walls, external and internal, in 4Ground kits, are double skinned for strength and to enable detailing inside and out of the model. The roof can be removed for easy in-game access, all windows have acetate and all doors are working. Preacher Samuel Johnson was born in Connecticut in 1847, raised by his Methodist parents, filled with the divine spirit he became a preacher in 1865, without being appointed by any church to do so. Again inspired by the lord in 1876 he knew he had to travel west ministering as he went. Preacher Johnson was inspired to head for the town of Dead Man’s Hand, on May 8th 1876 Rev. Johnson held his first service while walking on foot towards Dead Man’s Hand. That service was held with 30 men and five women in attendance, on May 11th they safely arrived in the town, without once being threatened by road agents or Indians. Preacher Johnson started his life in the town by working odd jobs during the week, while every Sunday he was on Main Street preaching. 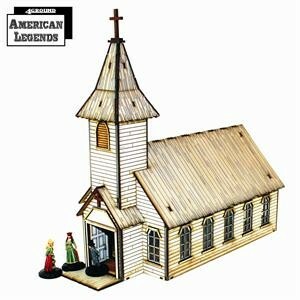 As the population of Dead Man’s Hand grew so did Johnson’s flock and thanks to the good Christian folk such as Albert Miller and Christopher Caldwell, in 1879 his congregation had built the first chapel in Dead Man’s Hand. Now the Preacher Johnson’s chapel is known as ‘the church’ and most folks know of him as Reverend Johnson, he still holds his church services every Sunday where he preaches about the inequity and vileness of some of Dead Man’s Hand prominent residents, the likes of Stuart Wheatley and ‘Slick’ Dan Pottinger to name but two. If he keeps upsetting the wrong people the rumour going round is that some one may find him on the road killed by ‘Indians’ very soon!